In my last blog, Local & Freestyle: GLEC Summer Culinary Nutrition Program, I shared the mission behind the program, our connection to Greensgrow Farms, who help make it LOCAL our culinary adventure that makes it FREESTYLE. I am delighted to share with you this week’s creations. This week we were gifted with red peppers, eggplant, zucchini, heirloom tomatoes and onions as well as other delicious foods. As I contemplated what could come from these amazing plant beings, I reached for my intuitive wand and returned to my kitchen lab with the perfect idea! 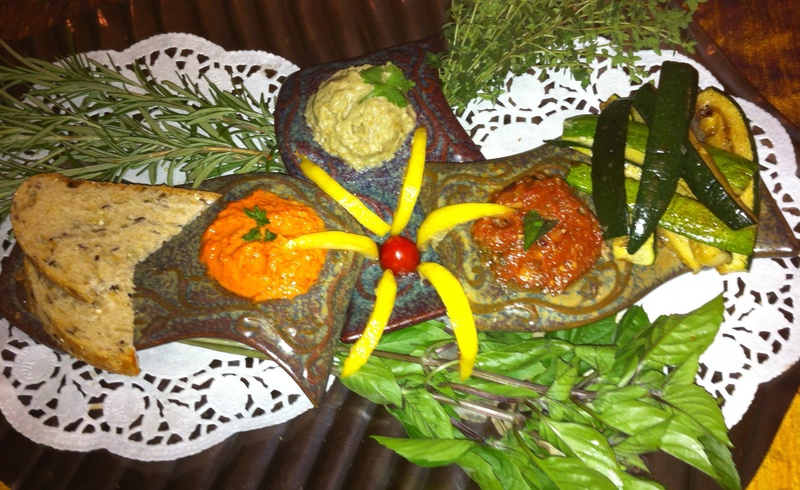 This week we made tasty dips, like Baba Ganoush, an eggplant hummus, roasted red pepper hummus and a fire roasted tomato salsa with poblano peppers. GLEC was more than gracious in providing tahini, lemons and a few other additions to accentuate our roasted vegetables. This week, like all others, I am greeted with, “what are we making today?”As the scent of roasted vegetables titillated their senses and vibrant colors peaked their imagination, they were ready to get their hands clean and dirty, and their taste buds jumping. They were ready to play, LOCAL & FREESTYLE! Our mini-lesson included an introduction to the nutritional and healing benefits of eggplant and red peppers, tahini and it’s protein factor and heirloom tomatoes and why they are not as “pretty” as the mainstream tomato at the local supermarket, yet perfect in their imperfections. The garnish for this platter, fresh thyme, rosemary and basil are also locally sourced, and born and raised in Germantown by one of my favorite farmers, Emma Morrow, whom I had the pleasure of working alongside of last year at the farmer’s market at the Wyck House in Germantown. Stay tuned for our final culinary creation with kids for the summer!